As if nothing had ever happened, I find myself back on the river, back in the gym and back into the routine to which I have become so well accustomed. I’m not going to lie – I haven’t found it easy. The alarm was a painful sound after three months of getting up whenever I wanted, and as someone who usually has no problem in the mornings, I found this particularly irritating. I spent the first three weeks arriving late to training and far from excited about the impending hours of sweating I was about to undertake. It was a sudden change from what had been my new normality, where the most exercise I achieved in a day was a short walk in the woods with my three-year old. There was one particular weights circuit session in the second week of starting back that took me to my lowest point. I was a mere five minutes into a two-hour session and the sweat was already pouring off. My muscles were burning with the lactic acid and I just couldn’t comprehend finishing. I turned to the door and seriously considered walking through it and never looking back. 95% of me wanted to leave, to never come back and never have to deal with the mental strain of exerting myself in this way again. I didn’t have to. I’d achieved what I’d set out to – an Olympic gold. What’s more, it was at my home games. It doesn’t get any better than that; it can’t be beaten so why was I back there, training for what? It was a stronger 5% of me that overrode that desire and now, 10 weeks on, I am so glad it did. I would have walked away with regret, unfinished business and unease with myself because it would only have been mental weakness that took me out of those doors. 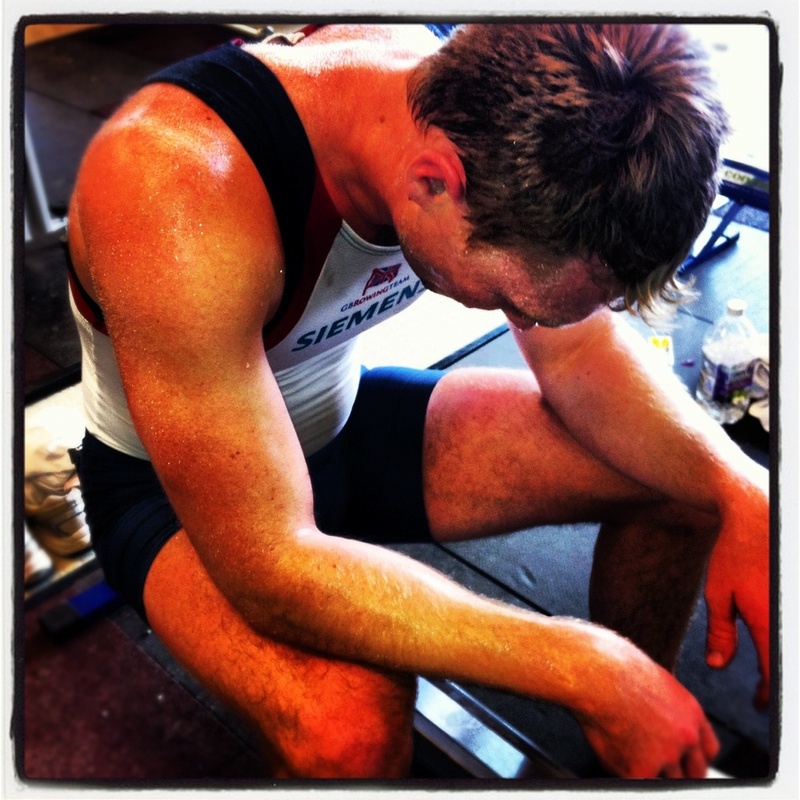 I made the decision to return to rowing after the Olympics not to try to better the experience, not to improve on my result, not even at this stage to necessarily equal it, but because I enjoyed it. I enjoy training, I enjoy the camaraderie among the guys in the team and I enjoy the racing. I still feel young in the sport and I have plenty left to offer. It wasn’t my time to ‘retire’ and that knowledge is, thankfully, what has kept me going. Motivation is a strange thing, and something I have been asked about a lot recently. What is my motivation to continue after having won gold in London? In my answer I always return to Beijing, where the turnaround in my career started. I was spare man for the team, ready to race if anyone became ill or injured, but of course no one was. I spent my time soaking up the atmosphere and watching the competitors. Although I wasn’t actually racing I felt the power of the games and what it means to families, athletes and whole nations. It was an exceptional experience for me, providing invaluable tools and new levels of motivation to change what I was doing and how I was approaching training. From the moment I stepped off the plane from China I was motivated with a clear direction of where I wanted to go and what I wanted to do. I have no doubt it helped turn me into the athlete I am today. This time, returning to training was on a completely different end of the spectrum. Although the words are clear – “I want to compete in Rio” – the pathway is not, and I must find the same driving force I felt after Beijing to push me through the next four years of gruelling, monotonous training. Another question that arises regularly is whether I will be competing in the same boat in 2016. The simple answer is that there are no guarantees, and just because I have won here in London does not automatically mean I have a seat in the boat. The slate was wiped clean on the first day back into training and we now return to the cauldron of selection where it is every man for himself. There has been a large intake of young guys with the same motivation that I had four years ago, desperately intent on beating me and taking my seat. This creates pressure on me, but also provides me with some of that essential drive that I know I will need to set me up in a good position in the lead up to Rio. This will give me a good chance of making the team, and then ultimately getting selected for the boat with the best chance of gaining gold again, but that is such a long way off with many thousands of miles to complete first. My concentration now has to be solely focused on regaining my fitness, strength and consistency. Happy to be back on the water, a rare rainless winters day! So, as the second month of the new year starts, I find the alarm marginally less irritating and the competitive drive to perform is slowly coming back. I am beginning to see a way through the winter grind; I’m sure I’ll be physically and mentally fit soon enough.